Yours Clothing is a store that’s been on my radar for years. When I first started blogging in 2008 it sat alongside “Next” and “Simply Be” as one of a small number of UK-based online stores that offered on-trend plus size fashion at an affordable price. Starting at a size 14, and going up to a 32 in most items, they cater to a broader range of sizes than almost every other brand I can think of and the range is extensive. They do street wear, party dresses, lingerie, accessories, and even wide-fit shoes and boots. The site is easy to navigate; you can filter items according to type, size, colour and price. If you’re looking for something specific it’s easy to search, or you can just browse and see what takes your fancy. A lot of the items have catwalk videos (so you can see what the item looks like worn) and the fact that buyers can leave reviews is something that I wish every online store would offer (*coughAsoscough*). 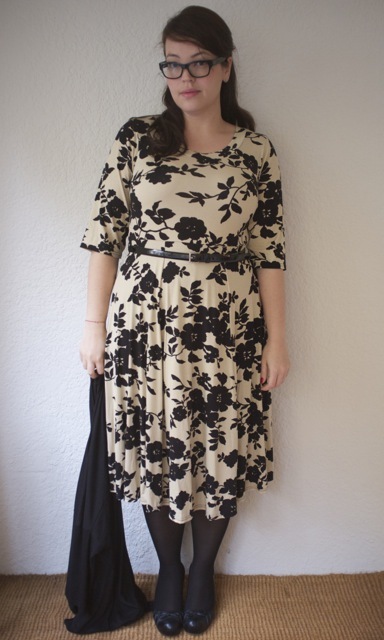 When I was offered the opportunity to try a couple of items for myself I had a tough time making a choice, but finally I narrowed it down to this beautiful floral print skater dress. The dress is available in eight different fabric: polkadots, butterfly print, dragonflies, red roses. 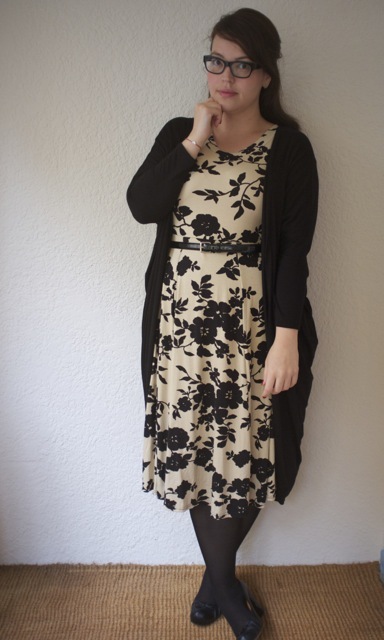 I particularly liked the black and beige – it reminded me of the ultra-elegant “Posh At The Party” dress from Modcloth, except more appropriate for daywear. I also ordered a long, drapey cocoon cardigan because it looked like the natural successor to my beloved blush draped cardigan, long-surrendered to the big glad rag bag in the sky. Neither dress nor cardie was much to look like on the hanger They’re both made of a thinnish jersey with plenty of stretch (but fortunately not the kind that creases if you look at it sideways) and just looked a bit limp and sad. Then I tried them on, and *POW*, love ’em. Sometimes you just have to put a body in things to really make them sing, don’t you? Fortunately for me, the weather in Melbourne’s taken a late season turn to the balmy, so I’ve been wearing the hell out of the dress. It’s super comfortable to wear – I had to go up to Brisbane for work last week, and this was an essential for the trip. It got smooshed up in my carry-on suitcase but emerged the next day completely wrinkle free. Was professional enough for me to look Grown-Up and Proper and Like A Real Boss Type Person, but at the same time it was comfortable enough to wear on the flight home too. Because the print is so bold it doesn’t need accessories, so it’s a great number to have in the wardrobe for when you’re feeling a) uninspired or b) ridiculously late for work. The cardigan’s a lovely piece too – the draped fabric, and batwing sleeves add a bit of drama and volume, but because the fabric it so thin it doesn’t add bulk. It’s perfectly warm enough to layer on inbetweenie days, and looks just as good teamed with cigarette pants, jeans, or a pretty frock. I’m starting to suspect I need the dress in another of the prints on offer. The dragonfly print is singing my name, and it’s even on sale at the moment. Have you ever ordered from Yours Clothing? What was your experiece like? 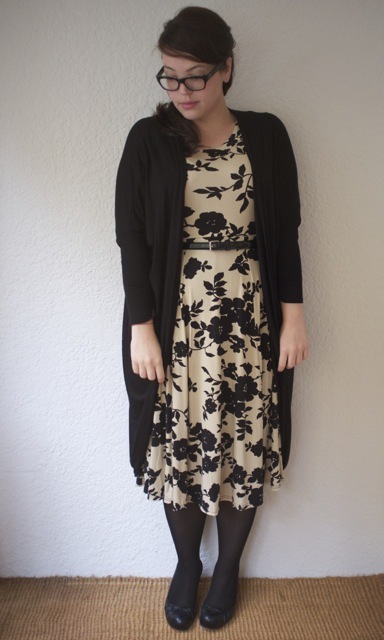 This entry was posted in Uncategorized and tagged Chie Mihara, cool, dress, sonsee, yours clothing by lillipilli. Bookmark the permalink. I love this outfit, you look so beautiful! Does it hit at your knees or more of a mid length? I’d love to get the same print but I’m thinking it might be a bit long on me. I’m only 5 feet tall and anything below my knees tends to make me look like I’m a little kid playing dress ups in mum’s clothes. I’ve been ordering from “Yours” for years! Love their stuff. So reasonably priced and pretty good quality. There have been a few things that didn’t quite hold up, but over all a good place to get lovely items. this dress is lovely! I could very easily be tempted! the colour is lovely on you! love the nail polish too! I’ve never heard of them but wow- this outfit is gorgeous! Perfect for work but still gorgeous! I have used them for ages – cheap and cheerful! The t-shirts are particularly roomy and comfortable. I recently ordered the same dress you have but in the black and teal combo. As you mentioned the fabric is sometimes thin, but that said, I also have some pieces that have lasted for years. The only regretful purchase has been a pair of pixie boots – the soles were so thin they wore out in a matter of weeks. 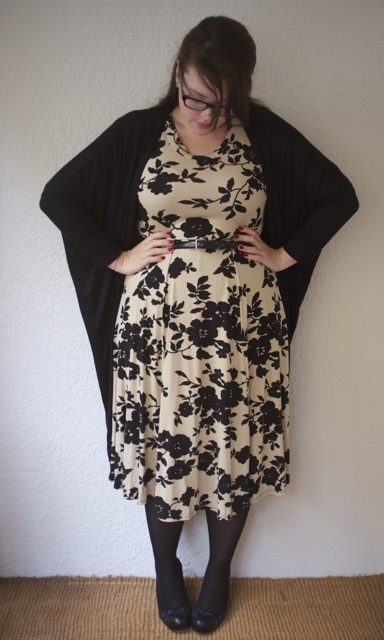 Beautiful dress, great choice with the long line cardi. I have been ordering mainly dresses from Yours for about a year. Great styles and prices, and I like that you can change the currency on their website, so you know the exact cost. You look simply amazing. One of my favourite looks I think.